When in doubt, please call toll free 1-800-884-4046 or email us. One of our big shoe size experts can assist you. Not sure how a particular brand fits? Let us help you! Listed below are some general fit tips by brand and style to help you find the perfect pair. Due to the fact that shoe sizing is an inexact science, we have compiled the following list of how each brand generally fits. Please note that shoes even within the same brand can fit differently from style to style. So use this guide as a starting point, along with our specific shoe fit description notes (on product pages) to find the perfect big shoes to fit for your feet. Birkenstock: tend to run big. Clarks: tend to run a bit big like many dress shoes. Creative Recreation: fit true to size, similar in fit to most casual shoes. Lacoste: while athletic inspired in design, Lacoste shoes tend to provide a more casual style fit and thus are more true to size then your average sneakers. LB Evans: house slippers that fit true to size. Magnum: tend to fit true to size. 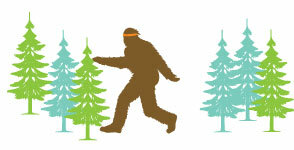 Nunn Bush: fit true to size, similar in fit to most dress/casual shoes. PF Flyers: simple design and construction gives these shoes a roomy fit but not as large as the Converse shoes and tend to be more true to size. Polo Ralph Lauren: fit mostly true to size, similar in fit to most casual shoes. Some styles run a bit roomy in the toe-box. Sanuk: these sandals tend to fit true to size. When in between sizes on a sandal it's usually safer to size down. Sperry: tend to fit true to size. However, since some people wear these without socks you may want to factor that in when you choose your size. Ugg: true to size. However, because of the plush lining in many of their shoes, they can often feel snug or tight when first wearing them. Under Armour: fit mostly true to size. Follow these easy steps to find your size. Note: It is easiest if you have someone assist you... but you can do it yourself. 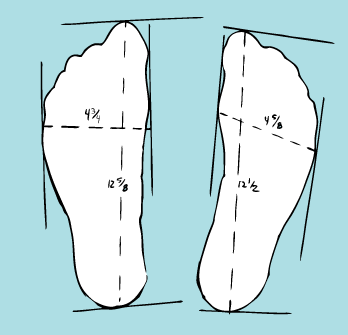 If you plan to wear socks with the shoes, wear the socks while taking measurements. Stand on a piece of paper with both feet (It is important to measure BOTH feet. Most people have one foot that is slightly larger than the other). We recommend taping a couple of pieces together because the large size of your feet may not fit on just one page. It is best to you stand because your feet will spread out more than if sitting. Trace your feet (or have your assistant do it). Try to keep the pen/pencil as vertical as possible and as close as possible to the foot. Draw a straight horizontal line at the heel and toe at the longest point and on each side of the foot at the widest point. Measure the distances between the lines (lengths and widths), then use the measurements from the larger foot. Be sure to double check your measurements. To get the true size of your foot, we recommended subtracting about 3/16 of an inch (or 5mm) from the length measurement to account for measuring an outline. Our Foot Model's larger foot measured: 12.625 inches long and 4.625 inches wide. So his exact measurements are 12.45 by 4.45 inches. This chart will give you a rough idea of what size you will wear in a "true to size" fitting shoe. It does not take into consideration other variables concerning your feet (i.e. flat feet, high arch, no arch, high instep, etc.) It also does not adjust for variations from brand to brand. All shoes fit differently.